Located on the South Western edge of the African continent, Namibia is one of the least densely populated countries in the world, second only to Mongolia. At it’s heart lies the vast, arid Namib desert which spans an area of 81,000 square kilometres. For riders, there’s also mile-upon-mile of near empty gravel roads. Our friends at GlobeBusters run a 2,500 miles, 18 day tour of this fantastic country, and in the October issue of Ride Magazine, Kevin and Julia gave readers some key information on riding in Namibia. Namibia has so much to offer, from the fantastic gravel roads heading towards endless horizons to the harsh yet beautiful Skeleton Coast, which is littered with the remains of more than a thousand shipwrecks. What Is It Like To Ride There? If you like a challenge then Namibia, with very few paved roads, is definitely a riding destination for you to consider. You’ll need to keep focused on the road surface at all times, especially when the sand blows over. All signage is in English, and the drivers are generally courteous. Ensure you plan your journey carefully, with adequate food, fuel and liquids to get you to your next stop. Two of Namibia’s must see destinations won’t let bikes in, but don’t be put off by that. The Etosha National Park is one of the finest game reserves in Southern Africa, and the deep orange Sossusvlei Dunes offer a magical desert sandscape. Once you arrive by bike, you’ll just need to join a 4×4 Jeep Tour to experience everything they have to offer. The city of Swakopmund can be reached from the Skeleton Coast, and offers some fantastic German style architecture (and beer)! You can also ride right to the edge of Fish River Canyon, the second-largest in Africa. If you’re planning a trip of four weeks or more, then shipping your bike to Cape Town takes around 12 days by sea freight. From Cape Town, you’ll need to allow around three days to reach the Namibia border, where you’ll have to pay for a cross-border permit for your bike. For shorter trips, you’ll need to arrange a hire bike in neighbouring South Africa, with permission to take it across the border. June to October is the busiest time to visit Namibia, but once you get away from Etosha National Park it is not particularly crowded. The temperatures at that time of year are tolerable, and rainfall is rare. Temperatures can be pretty uncomfortable between November and February. What Will You Need To Take? Your passport will need to be valid for six months from date of entry, but the good news is UK citizens don’t need a Visa. Take your UK driving licence and an International Driving Permit, which you can obtain from the RAC. If taking your own bike, you’ll be required to have the original V5C, along with a Carnet de Passage and the appropriate travel and medical insurance. 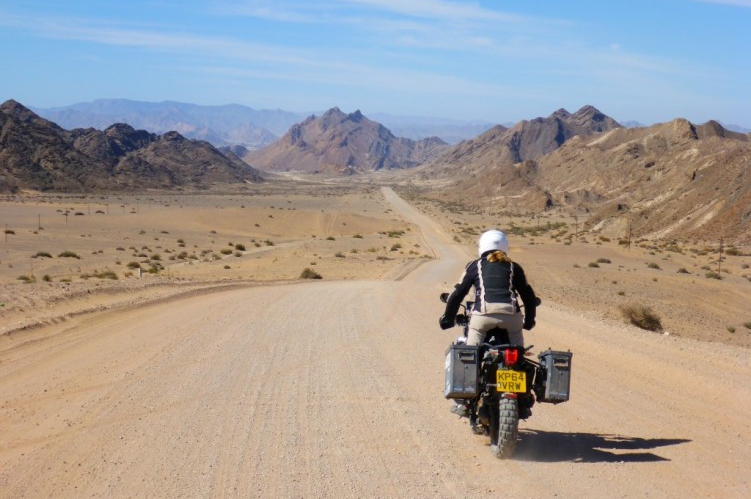 Your UK insurer will not cover you for riding your own bike in Namibia. One other important thing to remember ahead of any trip is tyre selection. As an official partner of Continental, GlobeBusters will select the right tyre for their needs from our adventure range ahead of each trip. With a high percentage of gravel roads, the TKC 70 is an ideal choice for a country like Namibia, offering excellent handling and durability alongside a genuine level of off-road ability. You can find out more about the Continental adventure tyre range here. This entry was posted in News and tagged Adventure, GlobeBusters, Off-Road, RiDE. Bookmark the permalink.